It’s been said that if you want to see where someone’s true values lie, take a look at their checkbook. I’m thankful that churches are taking family ministry more and more seriously, but I think the same principle can apply. What percentage of your church’s budget goes to training and equipping leaders and Sunday school teachers vs. parents? How much of the money is designated for creating experiences where children are separated from their parents vs. bringing the family together? When kids are at home watching 25 hours of TV in a single week and only getting that same amount of Bible teaching from church in an entire year, I wonder if it might be more fruitful to shift the bulk of our time and resources to the home instead of church programs and events. While we cherish those 25 annual hours at Red Door Church, our pastor added up the hours the team invested into those 25 hours. That’s 120 hours of work each week for around 30 minutes of teaching. It’s 6,240 hours of work for 25 hours of teaching each year. If those people earn around $20/hour, the church spent $125,000 a year going into those 25 hours, not to mention the costs for supplies, curriculum, production, snacks, crafts, etc. Before you realize it, a quarter million dollars were spent for those 25 hours of church programming and teaching. 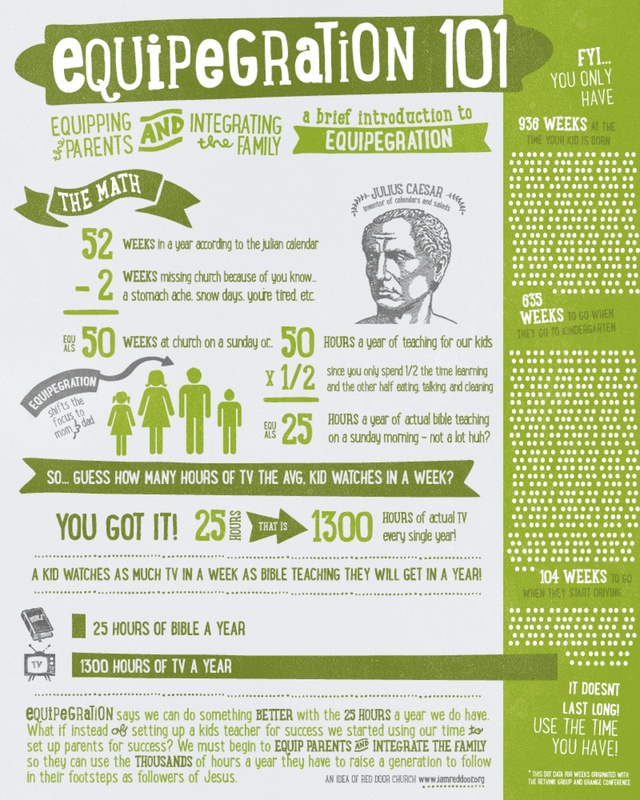 Of course, you could boost the 25 annual hours to a higher number when you consider the investment into relationship building times and events, but even if you double the number to 50 hours per year, the main point stays the same when you consider the amount of time the parents have (or could have) with their kids, or the fact that scripture establishes the family as God’s plan for passing faith to the next generation. We’re already attempting to integrate the family into Sunday morning services, but we want to take it further than that. We’ve actually been talking about this very thing on Sunday mornings for the past few weeks. It’s always been a part of our DNA, but we think it’s important to continually remind parents and the congregation as a whole what we value and how those values are executed in our community. Here’s the intro video we used before the message for the past two weeks at Red Door Church. Equipegration is what “equipping” and “integration” looks like for us. Here’s our pastor’s messages on it if you’re interested. QUESTION: How does your church’s time and resources reflect its value for the family unit? What would it look like for your church to further equip and integrate the family?